Giant panda Cao Cao and its cub were released into the Wolong Nature Reserve in China for the first time on Sunday. In an extremely delicate operation, their handlers wore bear costumes to minimise the impact of human contact. Canceled my cable last week because I don’t watch TV. I’ll catch him on the Net! Brought to you by China’s finest news source…. Next News! 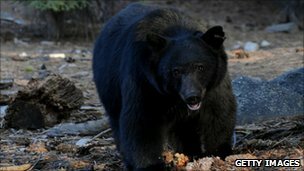 A woman from the US state of Montana has fought off a 200lb (91kg) black bear with a courgette from her garden. The bear attacked one of the woman’s dogs on the back porch of her home late on Wednesday evening, Missoula County Sheriff’s Lt Rich Maricelli said.